Additives and components dissolution in liquids are explained by hashing of molecules of different substances and grades. It is essential that the volume of a mix can differ from the sum of volumes of unmixed substances that testifies various compactness of molecular systems. So, at mixture of 100 cm of water and 100 cm of alcohol turn out to a total of 196 cm of a mix: in a mix of a molecule were distributed more compactly, than earlier. Process of additive mixing is defined by the sizes and a form of material particles, orientation and a spatial arrangement of each particle in mixed systems. Quality of mixed components depends on requirements and properties of a ready mix. Composite uniformity which can be defined in finished goods has importance. Currently on the market there is a set of various fuel additives which most of them promise improve of motor properties, economy of fuel, etc. There are additives for very specific applications, including solvents for cleaning of fuel system, stabilizers for preservation of fuel quality during continuous storage, and also an additive for greasing of cylinders and valves. So what is “an additive to fuel” means? Modern additives are capable to increase octane number, prevent development of bacteria and other organic chemistry, and stabilize fuel at continuous storage. However it is necessary to apply any additives that engine manufacture recommends, differently instead of advantage it can be harmful for engine. It is important to understand that the fuel which is located on the gas station whether it gasoline or diesel fuel, already contains certain quantity of some additives which has been set for local region. It is much more important to know how long fuel was stored and in what conditions. It will be decisive argument for use of additives. To deal with action of additives, it is necessary to understand that any fuel represents a difficult chemical compound. All types of fuel have molecular structure, and the additives which are dissolving in structure, change molecular structure of fuel for better burning properties, ignited strictly at a certain compression or for better burning at set average temperature and atmospheric pressure. 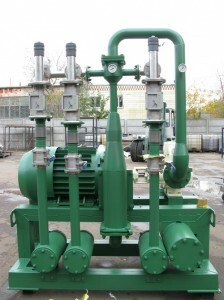 There are various methods and ways of additive mixing with fuel, the most widespread is mixing by ultrasonic cavitator. 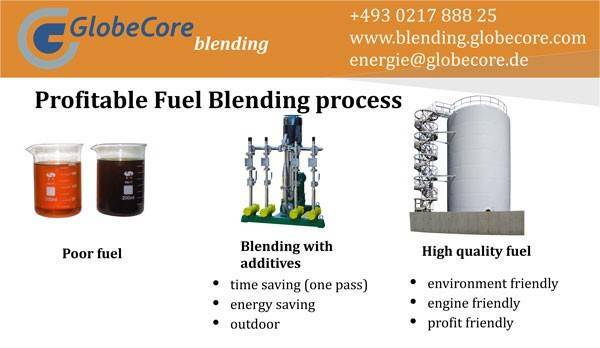 The GlobeCore Blending company is intended in production of such additive mixing systems. Basic purpose of installations is the intensification of processes of dispergating, homogenization and emulsification of various components, not compatible liquids and suspensions which in the end result of processing form the steady fine mix. The final product has resistance to a continuous uniform period of storage and is steady against stratification.